I simply loved this book. Liam and Emma are both so easy to fall in love with. Liam is your typical bad-boy rock star, or is he? He definitely has the bad-boy rep and he's been caught on camera with too many different women to count. But that bad-boy attitude isn't winning him points with his sister. After his latest tabloid appearance, she told him he can't spend time with his little nephew. So, he cuts off his hair (hopefully he'll be less recognizable) and decides to take some time off and escape LA. He rolls into the small town of Gardnerville and stops for a drink at the Wagon Wheel Saloon. That stop practically turned his world upside down. I loved Liam's little insecurities and how sweet he was with little Scarlet. While their attraction was obvious, I loved that Emma wasn't completely reckless in love. She has her head on her shoulders and she is actually a believable character (unlike so many females in romances these days). 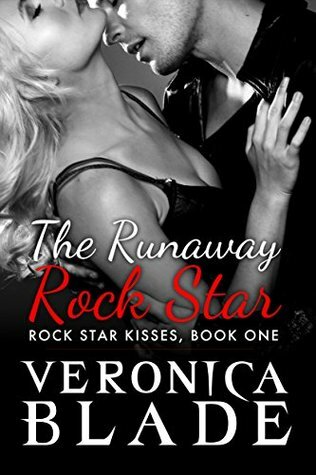 Kudos to Veronica Blade for writing an amazing story that you can't help but read in one sitting - and for doing it with one foot grounded in reality (believable characters) and managing to make write a romance that is relatively clean. While I wouldn't necessarily call it "sweet" - there are some definite sparks - the content is what I would consider "clean." We need more books like this. As Liam slid his palm around the nape of my neck and slowly inched toward me, I knew I should push him away. Kissing him was a bad idea. But since seconds ago when he’d admitted to wanting me, all I could think about was feeling him against me. Maybe I needed to get the kiss out of the way so my brain would start working properly again. He paused with his mouth hovering over mine, as if asking for my blessing. Oh, to hell with it. I dropped my purse on the seat, raised my chin, and slipped my fingers though the belt loops of his jeans. He moved in closer, and I inhaled sharply before his lips brushed my own. He moved his mouth over mine, lingering, teasing, then grazed my bottom lip with his teeth just before he withdrew. Shivers danced over my arms, and my stomach dipped. I barely caught my breath before his mouth came crashing down on mine again. I opened for him, and our tongues tangled, causing tingles to spread out from my belly. He took the kiss deeper. As dizziness swept through me, a small moan escaped my lips, and I gripped his arms to keep my balance. Abruptly, Liam muttered a soft curse, stepped away, and ran his hands over his head. “I promised myself I wouldn’t molest you. What the hell is wrong with me?” He dropped his arms and stepped back. Nothing was wrong with him. Absolutely nothing.